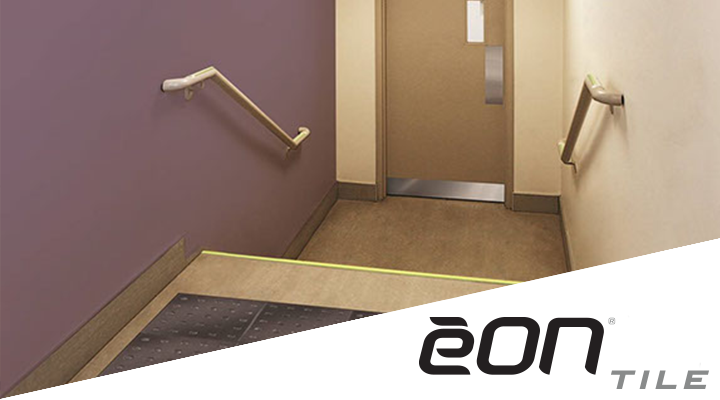 Eon® Tile is a durable and flexible tactile indicator chosen first by professionals who design and construct the finest commercial, institutional and public environments. Eon® Tile is state of the art polymers compounded together to create category leading quality and a contemporary look and finish. Suitable for a variety of applications such as airport concourses, railway stations, shopping centers, department stores, supermarkets, hospitals, swimming pools, schools, banks, community centers or most any high traffic environment. Eon® Tile’s line of products offer attention indicators (truncated domes) for warning and tactile direction indicators for way finding. Eon® Tile is part of the newest generation of excellence in warning surfaces from Kinesik Engineered Products Incorporated.